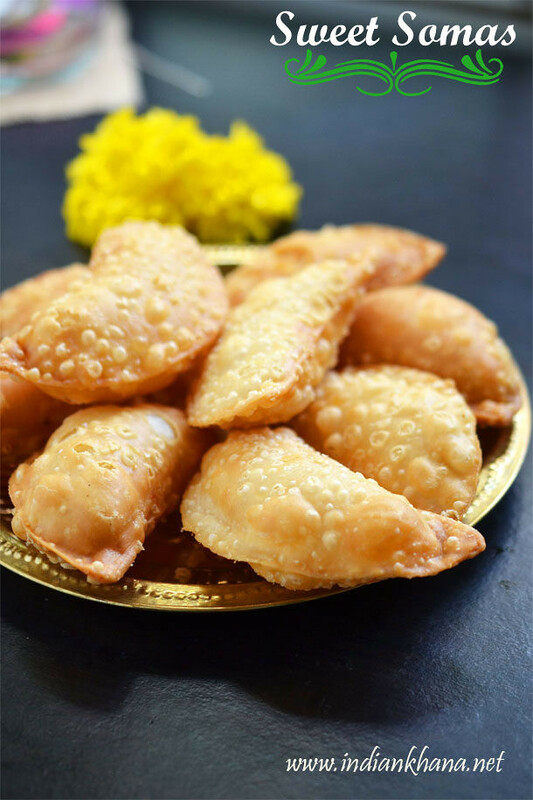 Since Gujiya is must for Diwali in our home, our mom will keep aside little of gujiya dough and will make somas or karjikkai, If I have to compare between Sweet Somas and Gujiya then of course I love Gujiya hands down any day over somas but then this somas is good change from gujia so I do make karjikkai/somasi too following the same trick as my mom, will just keep little dough from gujiya to make somas for Diwali Sweet somas also made with few variations but this is the most popular recipe and easy too. 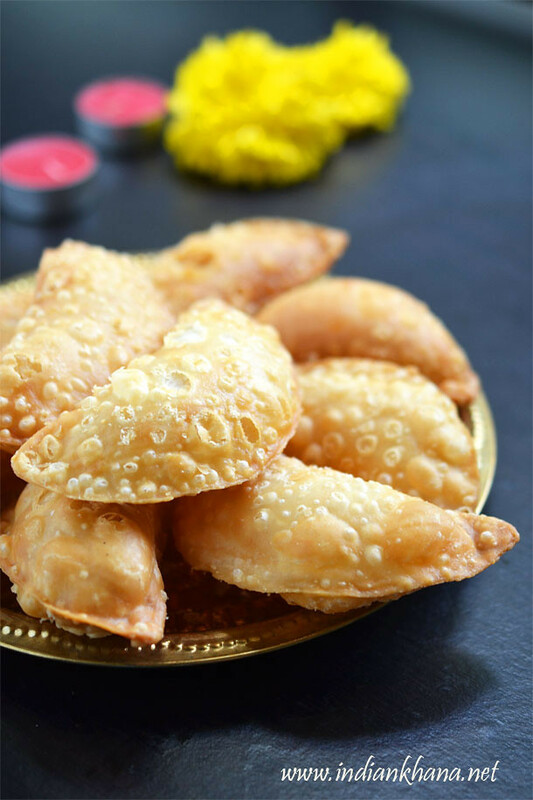 If you don't have want to try something different than gujiya then somas is a good change and it's something different. 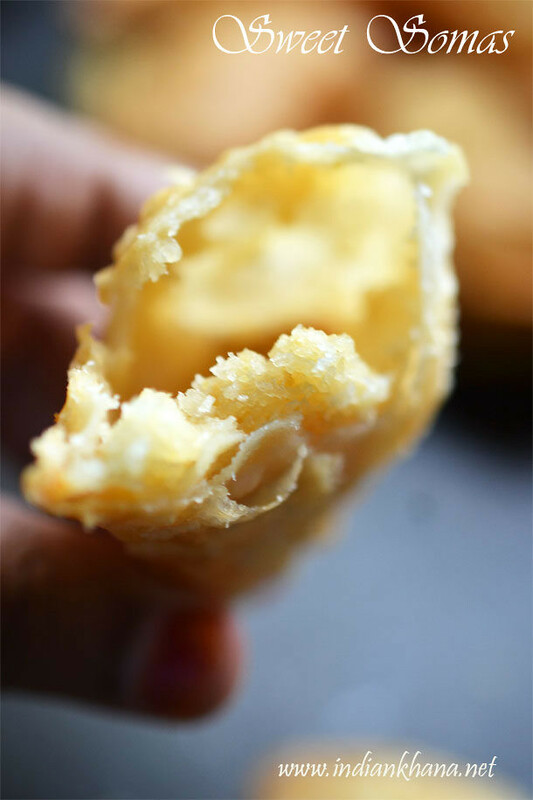 Fried gram, coconut with sugar and crunchy outer layer all together makes a great bite, you will be amaze how tasty it is though the recipe is very simple. I made this along with mawa gujiya as special treat for my brother and normally we make somas small batch. You can multiple the recipe to make big batch of somasi if needed. 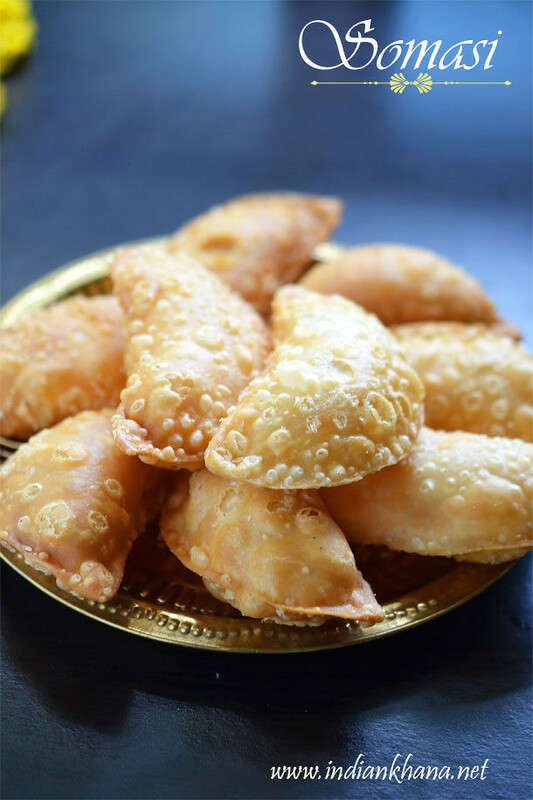 You can also check out my Sooji Gujiya Recipe And Mawa Gujiya Recipe. Gujiya South Indian version with simple filling for Diwali. For outer layer, in a wide bowl take flour, ghee or oil and mix well to get sand like consistency. Add water in small quantity and make stiff dough same like we make for poori, cover with a damp cloth keep aside for 1 hour or until required. In a wok or kadai dry roast fried gram dal (Pottu Kadalai) just for min, don't let it change color. Allow to cool and grind to slightly coarse (like rava) powder, sieve and keep aside. You can also grind sugar with cardamom. If you are using kopra grate and dry roast for 2-3 mins in slow flame. I used desiccated here and roast just for a min in slow flame. In a bowl or plate mix fried dal powder, sugar powder and coconut mix well to combine. Knead the dough again to make it smooth. To make Somasi, divide dough to make big gooseberry size balls, take one piece and roll into thin roti/chapathi of 5' diameter or size depends on the size of your gujiya/karanji/somas mold. The dough has ghee/oil or mooyan as we call, enough so I didn't applied oil or flour for rolling but if you need apply drops of oil or slightly dust with flour to roll dough and don't worry about the size/shape of roti/chapathi. Grease gujiya or karanji mould with oil slightly and place rolled chapathi on top of it. Place 2 tbsp of filling on one side of partition.Bring another partition together and close it. Press the edges to seal gujiya well and remove excess roti portion from mould and keep it with rest of dough. Press again to make sure somas is sealed well, gently open mould and take out somas. Repeat same for rest of dough and prepare somasi (grease mould with oil after making every 2-3 pieces). ~ If you don't have mould then roll roti and use a circle cutter or bowl to cut roti into round shape. Place filling and close somas forming half moon shape, press edges with a fork to seal and make impression or with hand pinch edges and seal it. Heat enough oil for deep frying and drop 3-4 somasi at time and fry in medium to slow flame until both sides golden brown, do turn 2-3 times somas to cook it well both sides, use slotted spoon and drain oil, keep in kitchen tissue to drain excess oil and fry rest of somas. Allow to cool completely before storing in air tight container. Stays good for up to week on room temperature. Outer layer dough should be stiff to make somas/karanji/karjikai cripsy. Add enough oil, ghee or moyan as we call so to make somas crispy yet soft, you can see layers in somas. If making in large batch make all the somas first and then keep fry if doing it alone. After you make somas if any of it get break and fillings starts to come out gently press where ever somas breaking before frying. While frying if any of the somas break then filling will spoil oil so take out that somas. Always fry somas in medium to slow flame for even cooking. 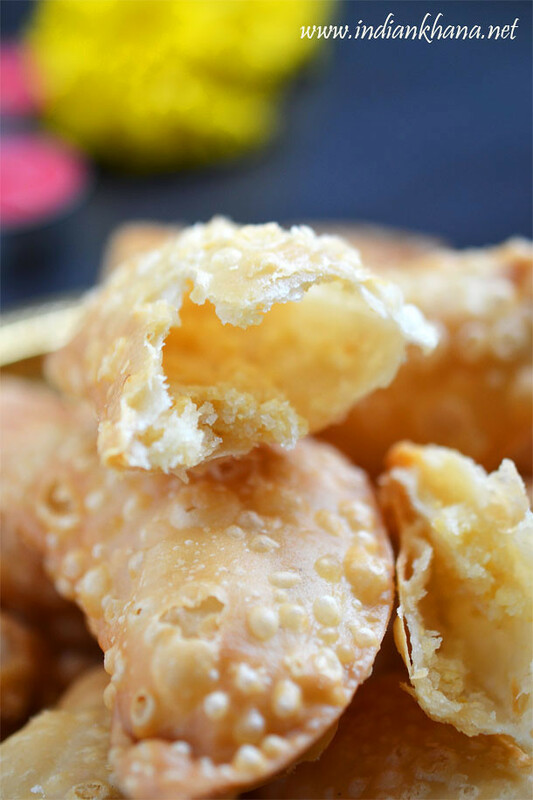 Easy and yummy Sweet Somas for any festival. 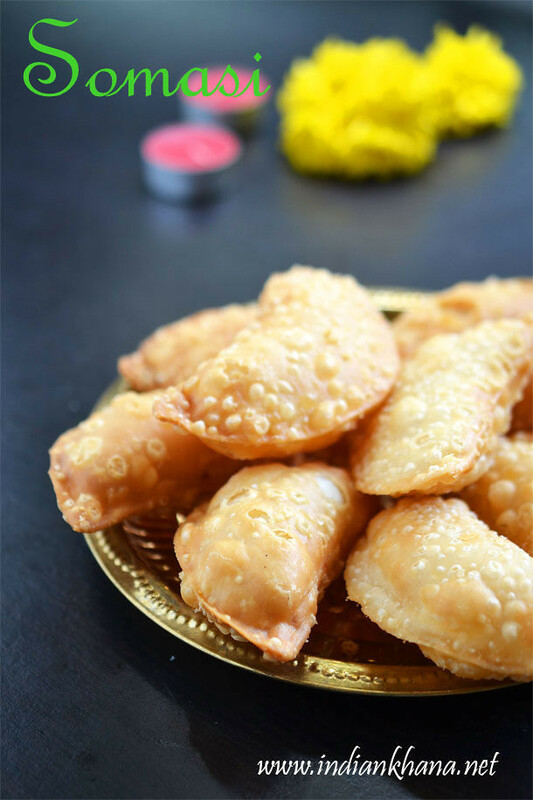 You can also check out my Sooji Gujiya Recipe And Mawa Gujiya Recipe.